Fund for Assistance to the ROCOR - Metropolitan Hilarion: "Every Person who is part of ROCOR needs to help Holy Trinity Monastery"
"EVERY PERSON WHO IS PART OF ROCOR NEEDS TO HELP JORDANVILLE"
On Friday, December 14, Metropolitan Hilarion, accompanied by several members of the Eastern American Diocesan Council, met with the abbot of the Diasporan Lavra, Archimandrite Luke (Murianka), with the stated goal of resolving these issues. The Metropolitan was accompanied by diocesan secretary Archpriest Serge Lukianov, Priest Alexandre Antchoutine, Deacon George Temidis, Deacon Michael Wengrin, Reader Peter Lukianov, and George. N. Nikolsky. After meeting with Fr. Luke and Hieromonk Cyprian (Alexandrou), Council members held a walk-through inspection of the monastery complex. 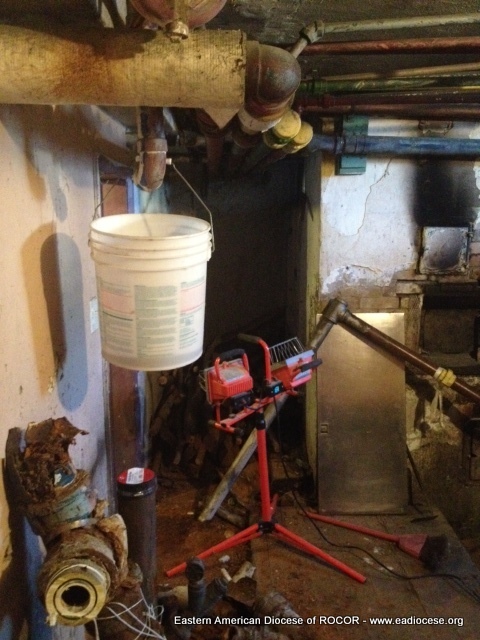 The monastery is in dire need of new wiring in the cathedral, the construction of a new seminary dormitory, construction of a new kitchen, bringing the whole complex into compliance with NYSDEC standards, and replacing all of the plumbing in the monastery building. The pipes are currently in such a deteriorated condition that the monks are unable to use the washing machines, while the seminary dormitory has begun to lean several degrees. 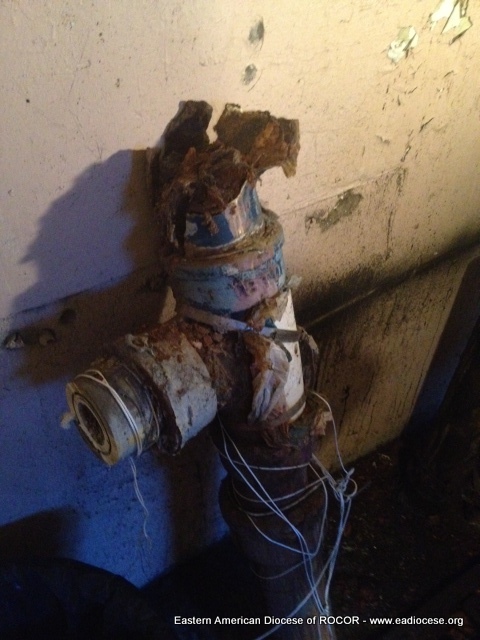 "It was absolutely painful to see how many repairs are needed," said the Metropolitan. After the tour, Fr. Michael Wengrin was in a state of shock: "What I’ve seen here is just deplorable. I don’t know how the monks survive under these conditions. I wanted to cry." Diocesan Council member Fr. Alexandre Antchoutine is a professional builder who owns and operates his own construction company. "All of the monastery buildings, from the main building and monastic dormitory to the cathedral, are out of date," he said. "They built them from the heart, with their bare hands, and using the materials they had at the ready. Now everything is deteriorating at the same time: wiring, plumbing – the entire infrastructure is in a severely dilapidated state." One of the monastery’s biggest problems is hard water, rich in calcium and other minerals. "The minerals are eating away at the pipes and plumbing," noted Fr. Alexandre. "I think it will take two to three years to repair everything here, and it will cost no less than three million." According to diocesan secretary Archpriest Serge Lukianov, the reason the monastery’s problems have thus far remained out of the spotlight can only be seen in the modesty of the brethren: "These monks are extremely humble and because of this, they do not share their problems with the rest of the world, and instead they bear their crosses in silence," he explained. "But the time has come for all of us to step up and help our monks." In order to help the monastery, the Eastern American Diocesan intends to launch an informational video campaign focusing on the restoration work being done in the monastery, as well as Jordanville’s significance for the entire Church Abroad. "How many people know that Holy Trinity Monastery is home to a small piece of the belt of the Mother of God? This is the same belt that recently came to Russia and over a million people stood in lines for upwards of 12 hours to venerate. This is just one example of the thousands of sacred relics and holy objects that are housed in Jordanville," said Reader Peter Lukianov. Council members hope that a series of video reports on Jordanville will not only assist in raising the required funds for the monastery, but will also attached more pilgrims. The Fund for Assistance (FFA) to ROCOR already launched a fundraising campaign to save the monastery from financial ruin back in October. Until the end of the year, the FFA has pledged to match the first $50,000 in donations. Over the past few years, the Eastern American Diocesan has worked closely with the Fund for Assistance. Together they hope to unite the faithful around the cause of helping the monastery. "The best way for people to help the monastery is to donate to the Fund for Assistance. This is one of only a very few organizations that charges no overhead on donations. Last year, they were able to raise over $240,000 in a few short months to help Holy Cross Monastery in West Virginia, and we are confident that together we can double or even triple that aid for Jordanville," said Fr. Serge. To raise such a significant amount as three million dollars will require the united effort of all ROCOR parishes and individuals. 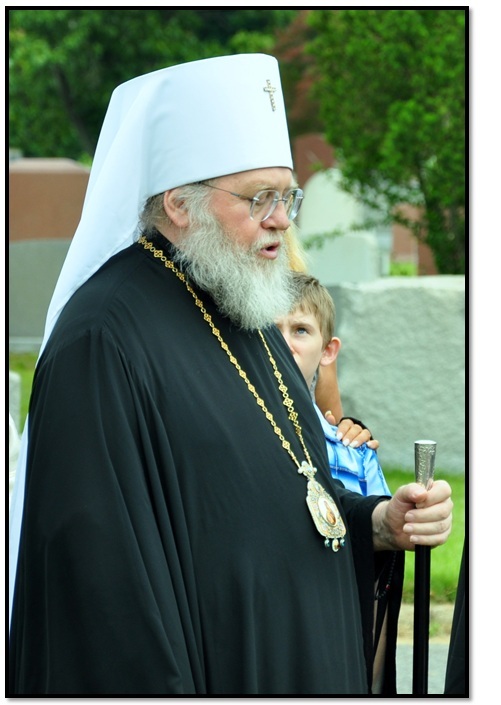 Metropolitan Hilarion hopes that the faithful can get proactive and organize local fundraisers in support of Jordanville at the local level. In the words of His Eminence, "Every person who is part of the Russian Orthodox Church Outside of Russia needs to contribute to help the monastery so that it may be preserved for years and centuries to come." Donate to Holy Trinity Monastery here! 100% of your donation will bring direct aid and reach its destination. The Fund for Assistance never takes commission from donations. Our administrative costs are paid by some of our Board members.